There has been a lot of buzz around the f8 conference this week where Facebook rolled out their ‘Timeline’ feature. Currently only avail to developers, soon to everyone. At the same f8 event was the announcement that Spotify will be offering 6 months of free unlimited service to new sign ups, just use your Facebook login as your account ID. The idea is that it gets us using the music and sharing so we will be familiar to sharing our music listening habits when Facebook opens that doorway soon. Well, you can share what your listening now through the Spotify app, but more so in the future. 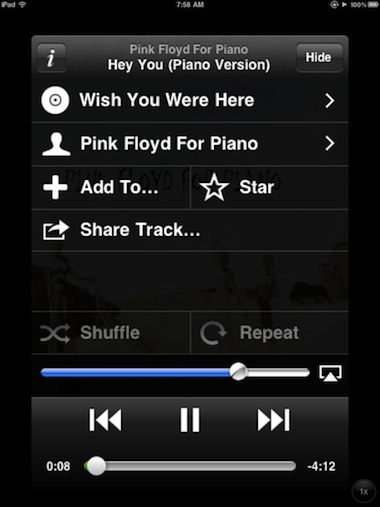 If you jump on board, you will be using the iPhone Spotify in 2X mode on the iPad. 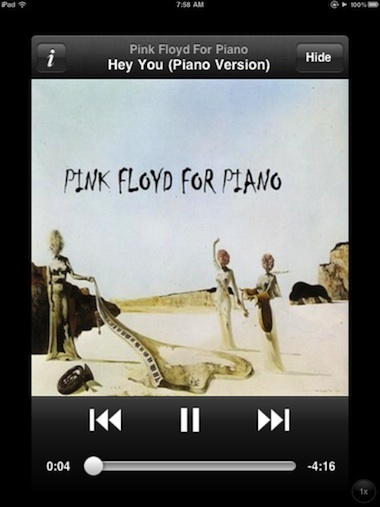 The experience is about finding music and streaming so high resolution or iPad UIs are not a concern… for now. The Desktop Spotify will look at your iTunes library and pull access to the songs in too, we won’t go deep into that system, this is about getting to many many hours of non-stop music listening on your iPad. We know we tortured the system all day when they announced the free unlimited option. Starting the Spotify app on your iPad, you can see how you can create ‘Playlists’ of songs and albums as you explore Spotify’s offerings. Across the bottom of the screen is the other areas of the app that include a Search, the latest Albums and News through the What’s New button and finally the Settings area to control the quality of streaming and syncing. 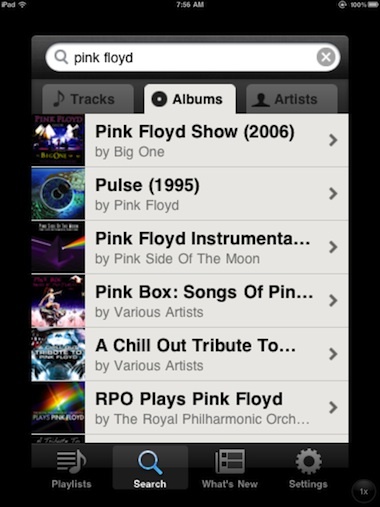 Search works quickly and to our surprise gives a very extensive list of songs back. They where not kidding about the quantity of music available through Spotify streaming services, claiming over 15 million tracks. 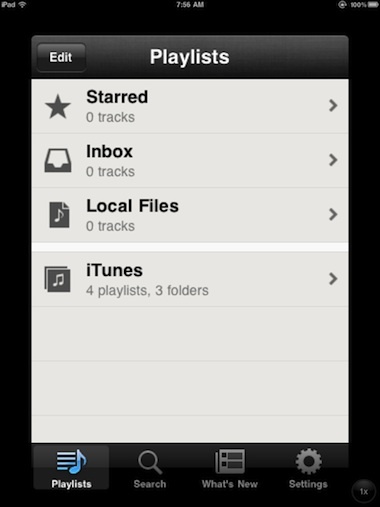 From a search, you can view at the Album, Individual Tracks or Artists level. You can still jump to other areas of the app. When you find a album to view, tapping it takes you to a list of the songs on that album that you can play individually, in order as they appear or shuffle. 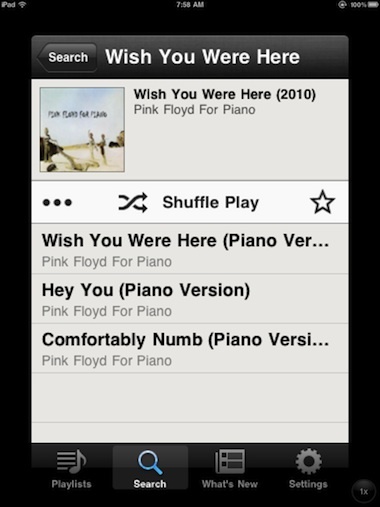 Spotify also allows from this screen to ‘star’ which adds it to your ‘starred’ Playlist. Choosing a song within the Spotify app gives you basic controls play/pause, next/previous songs and a slider to move through the song. Volume is controlled through the hardware button on your iPad. The ‘Hide’ button takes you up a level to the Album level where you can go look for another song or album and the music continues to play. All kinds of information is available through the information ‘i’ button both on the song and the album. As well, Spotify allows you to ‘star’ for quicker finding later or add to your music lists if you like to group songs for activities. As always, we like to share, so Spotify allows us to tell our friends on many social sites/services what we are listening to. This service must help with sales of albums since, if you choose to search and not use the ‘latest releases’ feature you will be stumbling on music you didn’t even know was available. The small print on listening to Spotify on Facebook, those minutes will count towards the total you have in the subscription package you have. We’re enjoying the music everywhere now but will see what happens when we have to start paying. 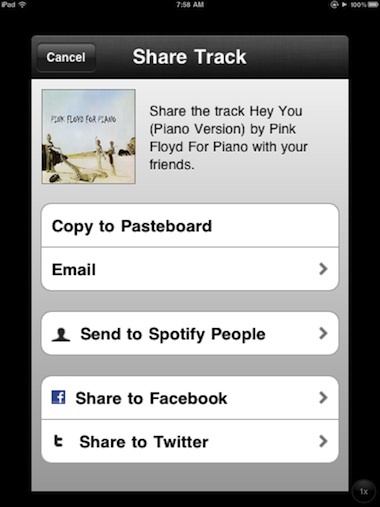 It does raise the question if Spotify will be built into a future Facebook iPad/iPhone app.